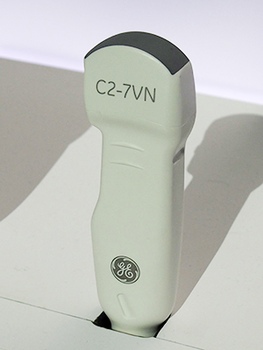 The used GE C2-7-VN-D microconvex probe is used for abdominal imaging applications with the GE Logiq e9 ultrasound systems. This microconvex probe has a wide field of view, which reduces blind spots particularly in intercostal areas. It has and operating frequency range of 2 to 7 MHz. Aside from the refurbished GE C2-7-VN-D probe, we carry a wide range of used ultrasound probes for sale. All you have to do is contact us through the form below and we’ll provide you a no-obligation quote. Better yet, you may speak to our sales experts by calling us at 877-661-8224, we’d be glad to speak with you today! I want a free price quote on the GE C2-7-VN-D, send it today!